Shark Therapy | When Do They Serve The Wine? It’s August, and that means lots of things. Background barbecues, street fairs, beach trips, and…. sharks. We all love to hate sharks, but hey, they can’t help it! 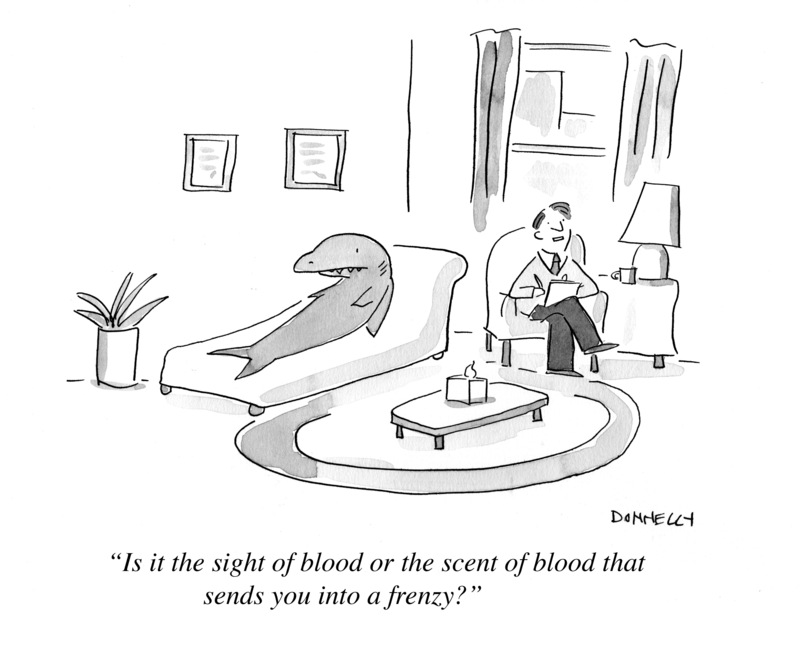 They are programed to follow the scent of blood (and if there are any marine biologists out there, correct me if I’m wrong). What if all they want is to be liked? Would a little therapy work? I feel for the sharks, but wouldn’t suggest therapy. It’s us humans that need therapy; it is their ocean, after all. Even though it makes for a fun cartoon to draw. This entry was posted in Random but Relevant and tagged beach, Marine biology, Shark, Shark Week, therapy. Bookmark the permalink. I don’t always reply or comment on each of your postings, but I really enjoy them each time and often send them off to my friends. I always have a little smile on my face as the “humor” of the cartoon registers. You have an unusual way of making your humor slightly subtle which calls on us, the audience, to “think” and have a moment to consider, “Ah. Yes. I know just what she means.” Thank you for giving us these moments. if he charges anything like mine does.